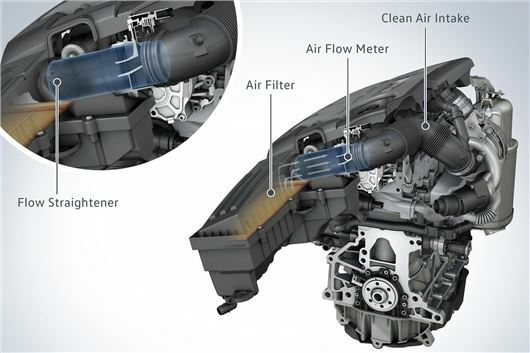 Volkswagen has today announced how it proposes to bring its 2008 - 2012 EA189 1.6TDI and 2.0TDI engines within European NOx emissions standards. The Volkswagen Group has presented specific technical measures for the EA189 engines affected to the German Federal Motor Transport Authority. These have now been ratified by the Authority. After the measures have been carried out, the vehicles will comply with European EU5 emissions standards. The final technical solution for the 1.2TDI will be presented to the Federal Motor Transport Authority at the end of November and is expected to comprise a software update. A “flow transformer” will be fitted directly in front of the air mass sensor on the EA189 1.6TDI engine. This is a mesh that calms the swirled airflow in front of the air mass sensor and will improve the measuring accuracy of the air mass sensor. (The air mass sensor determines the air mass throughput, which is a very important parameter for the engine management for an optimum combustion process. )In addition, a software update will be performed on the 1.6TDI. The workshop time is expected to be less than a hour. The EA189 2.0TDIengines will get a software update. The programming time for this will be around half an hour. The objective is still to achieve the applicable emission targets without any adverse effects on the engine output, fuel economy and performance. However, as all model variants first have to be measured, the achievement of these targets cannot yet be finally confirmed. Based on this, service concepts are currently being developed for all 28 EU markets concerned. The aim is to implement the update in the first vehicles during a recall starting in January 2016. However, to compete the entire recall is likely to take until the end of 2016. Volkswagen will contact all customers and endeavour to consider individual customer needs during the implementation of the recall to avoid any disadvantages for the customer such as possible loss of mobility. All customers will be offered free courtesy cars if required. Since the beginning of October, all Volkswagen customers have been able to check for themselves whether their vehicle is affected by the diesel issue. At www.volkswagen.de/info every customer can enter their vehicle identification number to obtain clear information. Based on the Volkswagen approach, VAG's other brands of Audi, SEAT, ŠKODA and Volkswagen Commercial Vehicles are also planning corresponding measures for their affected vehicles. In addition, until 31 December 2016, Volkswagen AG is expressly forgoing the right to plea on the grounds of statutes of limitations in respect of any warranty or guarantee claims due to the software installed in vehicles with EA 189 engines, as long as the rights to make any such claims have not already expired. Volkswagen customers will therefore not be disadvantaged by any waiting. In the meantime, the vehicles remain technically safe and can therefore be driven on public roads without any limitation.